I think April Fool's Day can be fun, but I'm not great at remembering to plan ahead and add gelatin to milk or add Googly eyes to all of the items in the fridge. If you are looking for a last minute April Fool's Day Prank that takes zero planning, here are a couple easy ideas to get you started. 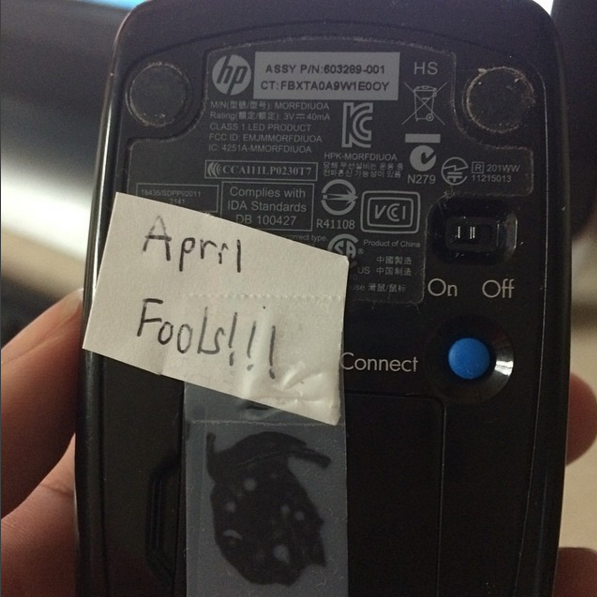 1 - Tape a piece of paper to the bottom of a mouse, covering the sensor. The mouse will not work and it will quickly, but briefly, drive the user crazy. Great for home or work and takes about 5 seconds. You can do the same thing with the TV remote and some tape. 2 - Change the language setting on the desktop, cell phone, or other device. Then enjoy watching them try to change it back. On an iPhone or iPad you just go to Settings > General >Language & Region. A quick Google search should get you instructions for other devices. Some desktops will let you change the orientation of the screen as well. Good luck trying to change the language back from Japanese to English when everything is upside down! 3 - Get in the break room fridge and turn around all of the tabs on soda cans. What once was the easy task of cracking open a drink now seems almost impossible. And at first glance it looks like there is an actual issue with the can! Send this gif to your friends and make them wait...and wait...and wait for your next text.